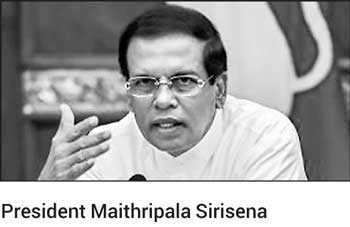 The Human Rights Council of Sri Lanka (HRCSL) yesterday rejected President Sirisena’s critical statements, insisting it has acted fairly and professionally within its mandate to protect the rights of prisoners and in vetting soldiers for UN Peacekeeping missions. Regarding the deployment of the Special Task Force to Angunakolapelessa Prison, HRCSL pointed out that one of the main functions of the Council is to monitor the welfare of detainees and protect their rights according to the recognised laws. As per Article 28 (2) of the Human Rights Commission of Sri Lanka Act No. 21 of 1996, the Council has been granted the power to enter and monitor any place of detention, police station or prison. Inquiring into the safety of detainees, their basic needs, sanitary facilities, and rehabilitation process is included in monitoring places of detention. Guidelines recognised by national and international laws are used for such monitoring of places of detention. “While carrying out this mandate, the Council must properly inquire into and investigate the complaints of detainees. Detainees and their family members have lodged complaints at the Council regarding the recent deployment of the Special Task Force and various other issues stemming from the deployment. It is the duty of the Council to clarify matters related to such issues. Therefore, the Council’s Inquiries and Investigations Division sent a letter to the Commanding Officer of the Special Task Force requesting information regarding the matter,” the HRCSL said in a statement. “The Commanding Officer has given an explanation as a reply to that letter. We must remind ourselves of the fact that many detainees have a reasonable fear of the deployment of external armed officers due to the violent series of events that took place in 2012 resulting in the murder of 27 detainees. Therefore, we would like to point out that in this instance, the Council has undertaken its lawful mandate in a fair manner,” HRCSL said. On the President’s concerns raised over HRCSL and the vetting process of troops, HRCSL said that it is due to the independence of the Council and the trust placed in the Council that in 2016 the United Nations designated the HRCSL to vet the Sri Lankan military and police officers for deployment to UN Peacekeeping missions. “We consider the fact that HRCSL is the only national institution selected to undertake the vetting process amongst all countries that supply troops for Peacekeeping missions as a triumph for Sri Lanka. Therefore, we strongly consider that it is our duty to undertake the vetting process with integrity and professionalism,” HRCSL said. HRCSL rejected claims that a move to bring back Sri Lankan troops from Mali was delayed because of delays on the part of the Human Rights Commissions. “The vetting process was suspended until a Standard Operating Procedure (SOP) was drafted, which is a unanimous decision was made by all stakeholders (the military, the police, Ministry of Foreign Affairs, Ministry of Defence, HRCSL and the United Nations). This decision was taken at a roundtable discussion held in June 2018 between the above mentioned parties in Colombo to solve a multitude of issues during the initial stages of the vetting process. “After the said SOP was agreed upon by all the parties, United Nations Department of Peace Operations informed that the vetting process can be resumed from 20 December 2018. Accordingly, the Council began the vetting process from that day. Therefore, we strongly disagree that the vetting process suffered setbacks due to any delays or carelessness on the part of the Council,” the Council said. The Council also strongly condemned the attack and violence targeted at Sri Lankan Peacekeeping troops in Mali in which two soldiers were killed. “We state with regret that holding the HRCSL responsible for the loss of the lives of those officers caused grave dismay,” the Council said. The Council noted that in the past three years, they have worked tirelessly to build respect for and trust in the HRCSL and as a result of that, the HRCSL was awarded international recognition in 2018 by the Global Alliance of National Human Rights Institutions (GANHRI). The Council said that it appreciates any just critique and considers it to be a step towards further growth and betterment, which they believe will serve the country better.